You know, the path to hell is paved with good intentions. In my quest to use as many strawberries while they are in season, I end up with an overabundance of Balsamic Strawberry Preserves. I just trade one problem for another (the story of my life). So with a plethora of preserves, I had to find a use for them. I swear, this recipe came about because I didn’t have anything in the house to cook with except preserves, eggs, and white chocolate chips. Add in a touch of boredom, and inspiration is bound to strike sooner or later. It’s incredibly quick to throw together (actually, it takes longer to preheat the oven). And it’s an impressive dessert for company too. The back notes of balsamic will keep your guests guessing about the secret ingredient. The light and airy quality seems so elegant too. I know a lot of people are afraid to attempt a souffle. Don’t be. They really aren’t as delicate as they were made out to be in old sitcoms – about the only real way to make a souffle fall is to a) open the oven door for an extended period (the blast of cool air is what does it); or b) let it sit too long before you dive into it. 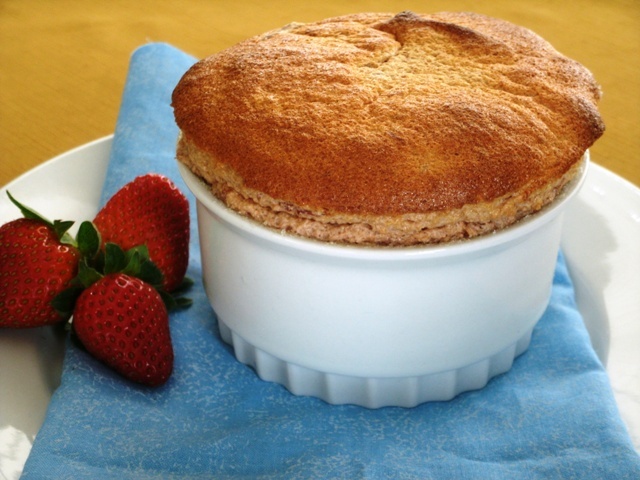 Eat the souffle as soon as it comes out of the oven. If you follow these simple rules, you should be fine. Place white chocolate chips and strawberry preserves into a microwave safe bowl. Microwave on half-power in 15 second intervals until the chocolate just melts. Stir to combine. Set aside to cool slightly. Spray four 8oz. ramekins with butter flavored cooking spray, including all the way up the sides. Add egg yolks to chocolate and strawberry mixture. Stir until incorporated. In a separate bowl, beat egg whites until foamy. Slowly add 2T sugar and continue to beat until stiff peaks form. Add 1/3 of egg whites to strawberry base and gently stir until incorporated. Pour Strawberry mixture into egg whites and fold until incorporated. Pour mixture equally into ramekins. Bake for 20-22 minutes, until browned on top, puffed, and set. This entry was posted in Cooking and tagged dessert. Bookmark the permalink. It was a wonderful experience for us. To have the job & the mess done while we were up north. And to know it would be done when we got here. We enjoyed working with you from start to finish! Great job! And good follow up – making sure we were happy. 2 great jobs – 1 kitchen & 2 bathrooms.